WHITE SULPHUR SPRINGS, W.Va. – Setting foot on the grounds of America’s first golf course took awhile – four years to be exact. Finally, though, it happened. That’s the good news. The unfortunate part is that Oakhurst Links, saved by a purchase by Jim Justice, owner of the Greenbrier Resort, was closed for the season a week into November. Playing this unique layout was not an option. 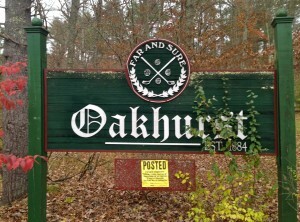 Oakhurst’s welcome sign is somewhat hidden in the woods and not really close to the road leading to the clubhouse.